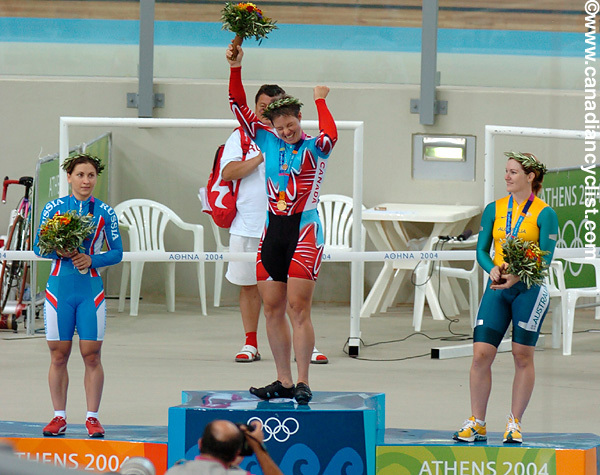 Earlier this week, Canadian cyclist Lori-Ann Muenzer was included in the 2015 class of athletes to be inducted into Canada's Sports Hall of Fame, in October [see Muenzer to be Inducted to Canada's Sports Hall of Fame]. 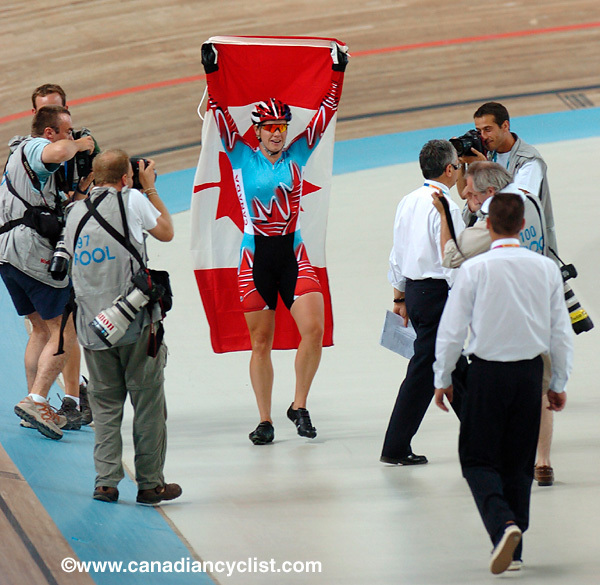 Muenzer, as the only Canadian cyclist to ever win an Olympic gold medal, was definitely due this honour. We have known Lori-Ann since her early days in the sport, when she first appeared on the scene as a mountain biker, before trying her hand at the road and then moving onto the track. One of my best Olympic memories is photographing Lori-Ann in Athens as she won her gold medal. We spoke with Lori-Ann from her home in Edmonton about her induction into the Hall of Fame, winning the gold medal and what she is doing now, nearly 11 years after she won her Olympic title. Canadian Cyclist: Congratulations! How did you find out about your induction? Lori-Ann Muenzer: It was five weeks ago. I got a phone call from the Alberta Sports Hall of Fame, and they said a gentleman was wanting to get hold of me, and could they pass along my number? I said, 'Could you just direct him to my website and he can fill out the Contact Me page'. They never did, and the phone kept ringing, so I thought maybe it was this person. Eventually I did get an e-mail from a gentleman in Calgary and I completely misread his e-mail... because it said 'we're going to be inducting you', and I said 'I've already been inducted into the Alberta Sports Hall of Fame'. He said, 'No, this is the Canada Sports Hall of Fame'. [Laughs] Five minutes later I called him back, a little embarrassed ... that was how it came about. CC: You are now the seventh cyclist to be inducted into the Hall of Fame. LAM: That's pretty cool and a very high honour. CC: Since Athens and the race season following it, you have been pretty low key in the cycling community. So what have you been doing since you retired? LAM: 2005 was my last season, trying to win the world championships with the crazy readjusted schedule that they had, and unfortunately it didn't happen. Part of what happened was ... I was 38 when I won my medal in Athens, and then I continued on for another nine months. But my financial situation dictated that I move on. I had a huge debt load that I was carrying, and the support that I received didn't cover my Visa bills, it didn't cover my line of credit. And at some point you've just got to look at it ... and it was way too much. When you are in debt over your eyeballs it is really hard to continue and sometimes you've got to step back and just say 'you know, I've got to move on', and that's what I've done. Since then I have run my own company with public speaking, I've been involved with LAMP that's modelled after Nancy Greene's ski program except on bikes - it's awesome. It's hard to believe that we are celebrating ten years of the program. There's close to 300 children, if not more, who have been put through the program. CC: And I guess that is something that people don't realize; they think that after you have won an Olympic gold medal, things must be great forever after. LAM: Yes that's true, and I think it's a huge myth. It's actually support and mentoring that makes the difference. So now, working at the grassroots level, you can have some of the greatest impact, and if you can instill the values of hard work, dedication, safety, integrity and respect, then it can all come together. And I've gone back to working full time. I work at Enbridge in the Human Resources Leadership Development department, and it's really awesome, it's where I can use a lot of my skills, a lot of what I brought to my sport ... the drive, the determination and planning, being flexible, trying to adjust to different situations that you are involved with in sport and apply it to business. CC: Obviously, you are aware of the new track in Milton. When you were racing there was very little available in the way of track facilities in Canada. Now we have a track program, we have dedicated track coaches ... what's your perspective on how things have changed. LAM: To be honest, I haven't followed cycling a whole lot. I've stepped back and am spending more time at the grassroots level. Having a world-class facility like has been built in Milton for the Pan Am Games is huge. I know that Edmonton has been trying for the last ten years to get the indoor velodrome built here but there have been a number of obstacles. To see the programs develop, to see it change ... I think we are starting to go in the right direction, but I think it takes a lot more than just saying 'Hey, we've got great programs'. LAM: I remember seeing you there! CC: So looking back on that with nearly 11 years perspective ... how do you remember it now, how does it sit in your mind? LAM: it's interesting, because my life is different now. But the root is still the same. The drive, the determination is still there, but it's in a different way. Back then I was living on a shoestring budget and working full time, and trying to get as many great hours and consistent hours of training as I could. Then you would go away and race, and you would literally just be focussing on that. Whereas now, I'm looking at things a lot broader and a lot more balanced. Have I ridden a track since 2005? No. I've hung up the wheels and, to be honest ... I gave everything that I had in 2004, and now it's about having fun, it's not just about being so serious all the time, and feeling like you don't have enough time to do everything, and doing "normal things". it's about bringing that part of your life into perspective, going out and playing, trying other sports and activities, and spending time with other people. Now it's fun, and it's totally different then when you are a full time athlete, or trying to be a full time athlete. CC: When you are out here in Toronto for the induction ceremony in October, is there a chance we can get you out to Milton and on the track? LAM: Sure, why not! That would be awesome, really awesome.